WHAT is the difference between state terrorism and individual terrorist acts? Terrorists who kill innocent people should be unequivocally condemned. But what of police officials who kill innocent people in fake encounters? This is the fundamental question that guides "Reduced to Ashes: The Insurgency and Human Rights in Punjab", the first part of the final report of the Committee for Coordination on Disappearances in Punjab (CCDP). It is an exhaustive account of political killings, enforced disappearances, torture, arbitrary arrests and prolonged and unlawful detentions by the police in the State in the 1980s and in early 1990s. 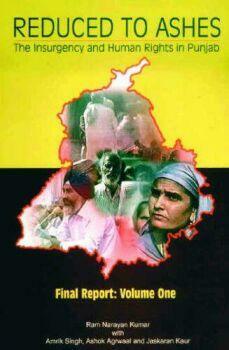 The 631-page report focusses on human rights abuses that occurred in the period between1984 and 1994. The broader precept of the report is to question how far the state can go against those whom it suspects of being desirous of its destruction. How are the people affected when the state, in order to curb terrorism, starts its own version of terrorism? While the report concentrates on the shortfalls of state officials, it does not reflect on the actions of the political elite. It devotes much attention to the functioning of the police, which "openly flouted legal procedures for arrest and search". According to the report, the police failed to respond to families’ requests for information regarding their abducted members; they extorted money from the families of victims; and they travelled outside their jurisdiction to detain people. The volume documents the prevalence of custodial torture and traces the pattern of its use against the family members of those detained; the destruction, expropriation or damage of property belonging to victims’ families; and the complicity of the judiciary in ensuring impunity for the police in cases of custodial torture and death. To cite one case from the report, 22-year-old Baljinder Singh, a resident of Saido Lahil village in Amritsar district, was employed with an agro-food company. On August 2, 1991 Baljinder Singh and Jagtar Singh, a security guard working for his company, were riding a two-wheeler. Unknown to him, Manohar Singh, a militant leader, was also riding a scooter in front of him. Manohar Singh committed suicide by consuming cyanide when he was identified at the police checkpost. The police, on suspicion arrested Baljinder Singh and his companion when they came driving up to the checkpost soon afterwards. Later, the police implicated both Baljinder Singh and Jagtar Singh in a case under the Terrorists and Disruptive Activities (Prevention) Act or TADA. Both were released after eight months. Two months later, the police raided the farmhouse owned by Baljinder Singh’s father and took Baljinder Singh to identify some militants whom they had arrested. The next day, his family members, who had started looking for him, were told by the police that Baljinder was not with them. The family contacted the Punjab Human Rights Organisation, which issued a statement demanding the release of Baljinder Singh. Soon after that, Baljinder Singh was declared killed in an encounter that supposedly happened near Sehbazpur village between a group of militants and the police. The report notes that this is just one of the cases with details of how the police did not provide the family with any information on who they were and where they were taking the arrested person. The report states: "Despite there being eyewitnesses to Baljinder’s abduction, they had no qualms about fabricating a story." The CCDP investigated a total of 1,703 such incident reports from all over Punjab out of which 889 were from Amritsar district alone. According to the report, this documentation involved the filling of an incidental report form designed and circulated by the CCDP, by the kin of the deceased. "The form was designed with an equal emphasis on descriptive and factual information, seeking political and family background, general circumstances of the disappeared persons, as well as dates and facts of atrocities and the evidence to corroborate the allegations," the report says. A status report was prepared for every form after cross-examination. This led to the second stage of verification, which involved interviews to elicit the victim’s point of view. This fresh documentation has been done by the CCDP after the Central Bureau of Investigation (CBI), under the directions of the Supreme Court, came up with its list of 2,098 illegal cremations, including those of 582 fully identified, 278 partially identified and 1,238 unidentified persons carried out by the state agencies at the three crematoria in Amritsar district. The whole of the CBI’s December 1996 report remains secret on the grounds that disclosures will hamper further investigations. On its own, the CCDP has managed to investigate a total of 1,703 incident reports from all over Punjab, out of which 889 are from Amritsar district. Out of these 889, only 672 figure in the CBI list. The present volume presents summaries of those 672 cases. The remaining 217 incident reports from Amritsar, along with 814 from other districts of Punjab, will be presented and discussed in the second volume. The CCDP has compared its data with those of the CBI and found fault with the CBI’s investigations on four fundamental issues. First, a large number of persons cremated were clearly named by the Punjabi press and the CBI failed to identify them. Second, families of many victims spoke to CBI officials and also filed information at their office in Amritsar. The CBI failed to use this information in compiling its list of cremations. Third, in many cases the police handed over the bodies to the families and the cremations were carried out in their respective villages in the absence of the police. Why did the CBI record these cremations as carried out by the police? Finally, did the CBI purposefully conceal the identities of some of the people it included on its third list of cremations of unidentified persons. THE report makes a case not only against the CBI but also against the National Human Rights Commission (NHRC). It accuses the CBI of presenting half-baked information to the Supreme Court through its list of victims of police atrocities. On the other hand, in the 1996 order the Supreme Court had found the CBI report convincing and pointed out that it "disclosed flagrant violation of human rights on a mass scale". Instructing the CBI to investigate the criminal culpability and to submit a quarterly progress report, the court appointed the NHRC to determine and adjudicate all other issues and to award compensation. The report is extremely critical of the NHRC on its failure to set up a broad framework for inquiry, which according to the CCDP, should have included investigations of incidents reported from all over Punjab in the search for more illegal abductions, enforced disappearances, arbitrary executions and disposal of bodies. The report has found the NHRC lacking in `conceptual deftness’ which led to the defeat of the very purpose of its intervention. When the CCDP approached the Supreme Court with some of its grouses against the NHRC, the former rejected its application. The CCDP then decided to abstain from NHRC proceedings. The report says: "The NHRC has made no attempt to reach the victim families and receive their depositions although it has become abundantly clear that all of the agencies involved in the counter-insurgency operations, including the CBI, are complicit in the conspiracy of impunity." No doubt, the report gets into an instructive mode and rhetoric on what could have been done by various state agencies in the past one decade. On more than one occasion it takes to the tone of "us against the whole system". However, such limitations should not be a reason to ignore the fundamental claims of the report of alleged killing of innocent people by the state. What is the need for such a report when Punjab has seemingly followed the path of peace? The CCDP says it acts "because of conviction that the recovery of atrocious truth in a social and political space, where society as a whole can take responsibility, is a perquisite for the resolution of wrongs". Perpetuation of terrorism needs to be stalled as quickly as possible. But the erring police officials need to be punished and those professing and standing by counter-insurgency need to be corrected if hope for a better future is to be preserved. The report makes a serious claim that only 10 per cent of the survivors from the families that suffered enforced disappearances and arbitrary killings have, in any manner, come forward to make claims. If this is true, then it should be a cause of concern not only for human rights organisations but also for those researching the role of the state as oppressor.